I used to make stew dishes on my stovetop. 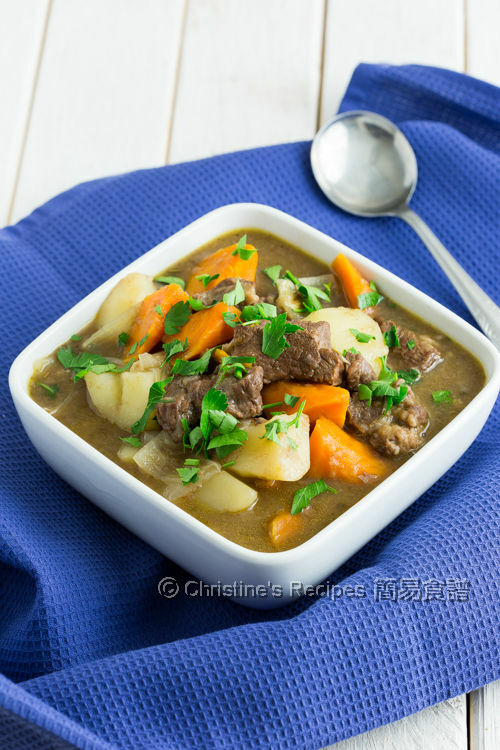 To make this Italian Beef Stew over stoptop normally takes about 2 to 3 hours before it’s ready to be served on diner table. Once I got my Instant Pot, I first wanted to try its stew function testing how well it could cut down the cooking time. 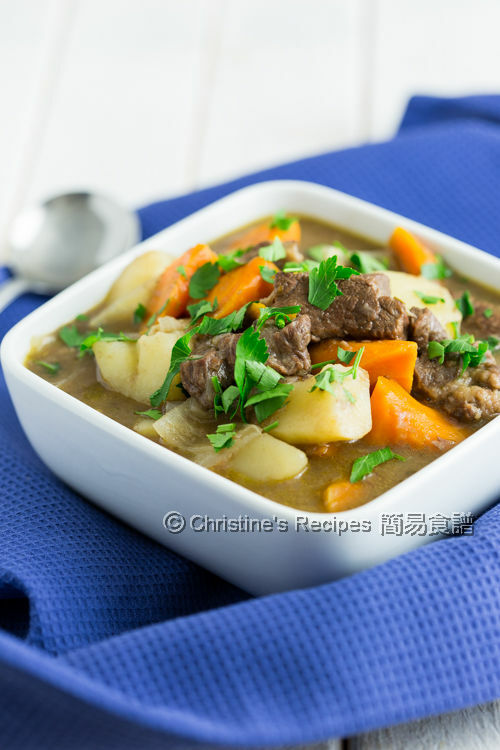 I tested this dish and found its high-pressure cooking function can turn tough cuts into tender meat around 1 hour with delicious sauce that my family loved it very much. This dish goes really well with steamed rice, pasta or noodles. I also found my kitchen won’t be heated up while making stew dished if I used my Instant Pot. You’d imagine I feel so great especially when I crave for stew dishes on warm days. You wouldn’t know if I didn’t tell you. This was the stew dish I craved and made on a very hot day. Was I a bit out of my mind? I simply felt my cooking and eating was not being tied by the weather with a sense of freedom. Cut beef into chunks. In a food-grade bag, put in plain flour, paprika powder, salt, black pepper and beef. Shake the bag and coat the beef with flour mixture evenly. Set aside. Prepare Instant Pot: Select “Saute” programme (medium) to heat oil. Gently shake away excess flour mixture from beef. Lightly brown the beef surface in one layer without overlapping or crowding. Cook in 2 batches if necessary. When the surfaces turn lightly brown, add shallot and garlic. Stir to combine. Sprinkle rosemary, oregano and cayenne pepper. Pour in red wine. Cook for 1 to 2 minutes and let the alcohol boil away. Add stock and Worcestershire sauce. Cover the lid and turn the steam release handle to “sealing” position. Press “Meat/Stew” button and cook for 20 minutes. Turn handle to “Venting” and run quick release. When the valve drops, remove the lid. Add onion, potato and carrot. Again close lid, select “Sealing”, “Meat/Stew” and cook for another 12 minutes. Run quick release. After the valve drops, carefully remove the lid, add Worcestershire sauce if necessary. Season with salt and pepper. Garnish with parsley. Serve hot. 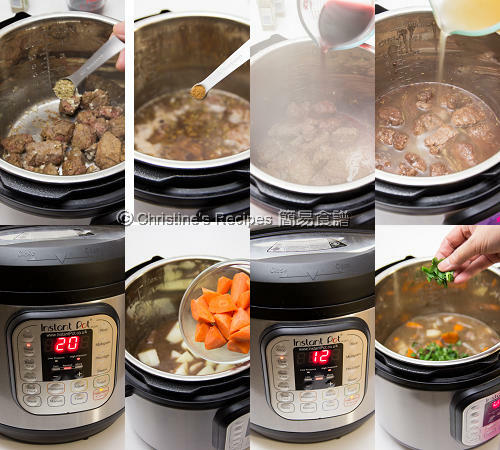 You can use cheap beef cuts for making stew in this pressure cooker. I used chuck steak as it has less fat. You might skip the red wine if you don’t have any. But I recommend it as the taste of this dish will go up a level. The alcohol will be boiled away. Buy the cheapest one or your favourite brand. I used Shiraz this time as we like it the most. Paprika powder is not hot, but with a bit of sweetness. Cayenne pepper is hot, only used a little amount of it in this recipe. These two spices will help increase layers of taste. If you’re not into any spicy foods, you can skip them though. Paprika powder and cayenne pepper are available at supermarkets. This is PERFECT for the weather we have over here. So yum!